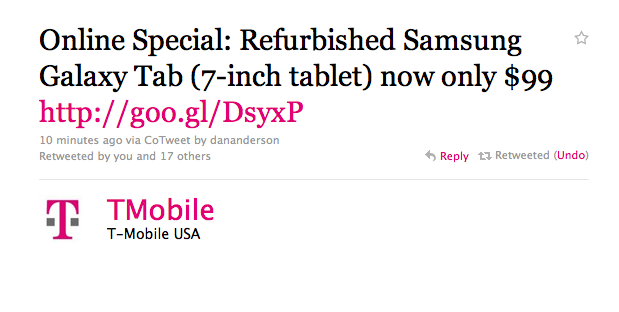 As a special deal T-Mobile is offering the Galaxy Tab refurb for just $99.99 with a 2 year contract on T-Mobile.com. There is no indication of how long quantities of a refurb device will last so act fast if you can’t pass this deal up! you can, call customer care and have them change it – be warned though that once you change to the Mobile Broadband Product type on that line you cannot make it a cell phone again. That’s not true. I changed a webjet line to an unlim loyalty plan two days ago. Care will change it in order to not have the line cancel. This was great news!!! since i have tmonews on my fb, i found myself saving another 50bucks on my samsung tab… that i just recvd yesterday at 149bucks. sooooooo thanks tmonews for saving me even more money. anybody that’s entertaining the idea of getting a tab, grab one. at 99 bucks it’s a super deal. my wife and i share ours. she reads books and i use it as a super street level tool. wish i could afford another line. I gotta be honest…as tablets go, this thing ROCKS. This 7″ form factor is pretty sweet and it’s so nice to hold in one hand. My 3 year old daughter loves it and I’ve put many kids games on there. Plus with the Nook and Kindle apps, getting her to hold it while teaching her to read is awesome. One of the best investments I’ve made. Just bring on Gingerbread for it and I’m good. Bought one even though Im getting an galaxy tab 10.1 next month. Too good for the price..
Ehhhhh… I dunno. I guess if one already has a family data plan and you can somehow add the $99 tab to that family data plan, then it’s worth it. otherwise… new line or add-a-line, 2 year contract… the cheapest data plan is $30 a month = $720, plus $99 for the device = $820 for a used Galaxy tab. Is it $200 etf? I thought they raised the price for smartphones unless that’s only att and Verizon? Why would I want to sign a two year contract for a tablet? Maybe for the discount. But since there’s so many tablet on the market nowadays these things will only Getting cheaper. Does this support 4G? Also, I heard this doesn’t have Android 3.0 on it. Do you know if it will get an upgrade? If so, when? (I’m still waiting for 2.3 upgrade on my Samsung Galaxy S 4G) Thanks!! The Galaxy Tab does NOT support 4G. It’s also currently running android 2.2. I doubt it will get an upgrade to 3.0, but maybe a Gingerbread update. 3.0 on this tablet seems like kind of a waste anyway because it still has the navigation buttons at the bottom. Deal is still running. Its until stocks are out, there is no set date. Ordered mine yesterday and if you call they will allow you to use your device credit line. Also you get 20% off any data plan if you have a voice plan.